Communication is the key to almost everything humans do. Whether it's sharing a favorite memory, asking for a cup of coffee, or requesting a medication from a doctor's office, it's important that the right message is relayed. For individuals who rely on a Lingraphica augmentative and alternative communication (AAC) device to speak, it's now easier to share these personalized messages. 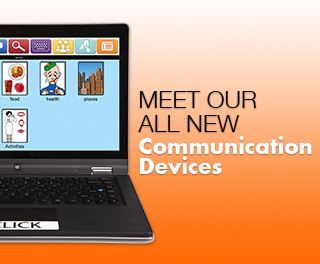 With dozens of new features, our AAC devices allow users to share those messages in more ways. Now, device users can communicate with friends, family, and peers using our email and instant message features. By clicking on the yellow communication hub button, users can send emails and greetings or instant message with anyone in their address book. Also available in the communication hub is a whiteboard. This feature enables users to write or draw message on their device, eliminating the need for pen and paper. Every device now comes with our specialized news source, TalkPath News. The news reader is updated daily with news articles in eight different categories. Users can listen or read along with each article and answer comprehension questions at the end. The news articles are accessible in the expanded "therapy activities" page. Our language system now comes with more than 9,000 words and phrases. We added the vocabulary words based on feedback from current device users. Now, individuals will find phrases that better reflect their wants, needs, activities, and interests. Plus, select from 17 different voices to match the device user's personality and voice. Lingraphica's technical support team is still available for all of your device customization needs. Our support is free and available for the entire life of the device. Just call our team at 888-274-2742. If you're ready to try a communication device, call our clinical team and select the model that best fits your needs. You can reach us at 888-274-2742.